I'm reading an interesting book by Chris McDougall called Natural Born Heros (NBHs). 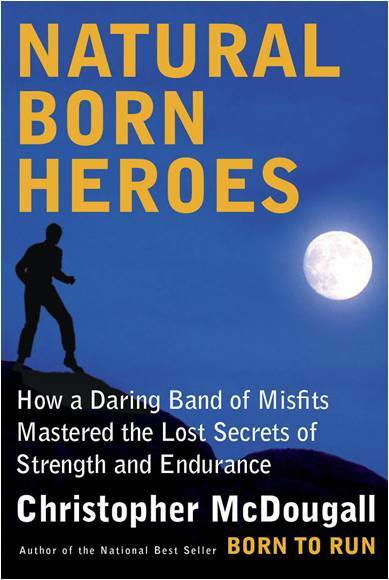 McDougall wrote Born to Run, which launched the minimalist running movement. That craze has since given way to maximalist, pontoon-like trainers from Hoka and other shoe companies, but I still love my Kinvaras. Natural Born Heros is about athleticism and self defense that is developed through practical need rather than controlled competition. The through-line story in NBHs is about how Churchill's special agents worked with Cretan shepherds and farmers to significantly disrupt Hitler's progress toward Russia during WWII. Like Born to Run, McDougall writes a lot of about physiology, especially the role the fascia plays in energy efficiency and power. I'm only halfway through the book but I understand running technique is discussed further in the story. This was a particularly busy work week for me, so much so that I ended up going into the office every day. I count on my work-from-home Fridays for one of my weekly runs. Knowing that wasn't going to happen, I did an elliptical workout the night before. This morning I needed to get back to the road, but that didn't go too well. I can't explain it, but I couldn't really get going this morning. I tried to appreciate the pleasant weather and the fact that I wasn't stuck on the treadmill. All the same, I was glad when the run was over. If I'm up to it, I may head to Bethpage tomorrow and would like to cover at least five miles. My running buddy SIOR is up in Kennebunk for the 2016 Shipyard Maine Coast Marathon. She's running it with a friend who's doing his first marathon. I'm wishing them both lots of fun and I'm hoping she breaks 3:30!